Baby shower craft ideas you can use to make, baby shower favors, baby gifts, or even a fun shower activity. Use approx. 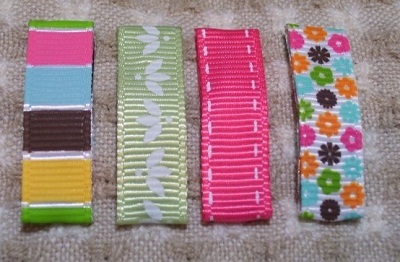 6 inches of ribbon (1” wide). 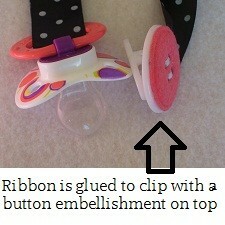 Use a non-toxic hot glue to attach one end of ribbon to clip. 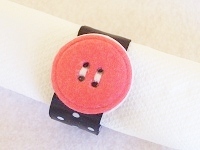 Cover with a cute embellishment. Run the other end of the ribbon through the pacifier ring. 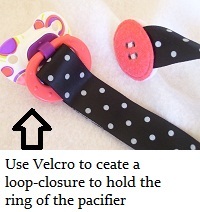 Use self-adhesive Velcro to create a fastener that will hold the pacifier. Use the clip to secure ribbon around napkin. As with any paci-holder, baby should be supervised. Never put baby to bed with any pacifier holder. Get more craft ideas to use for baby shower activities-including ideas for co-ed baby showers. Pregnancy notes and ultra sound pictures. Baby at 1 month, 2 months, e.c.t. First milestones: Smiles, Sitting, Scooting, Eating, Crawling, e.c.t. and up. 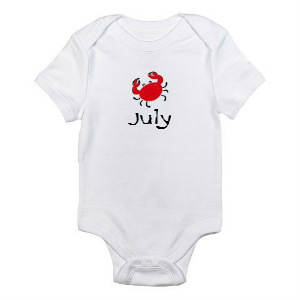 If you’re buying bibs, look for ones made of, combed cotton. Gather and cut cardboard pieces; the cardboard should fit inside the garment. This will prevent paint-bleed between front and back of the body suit. sponges, or other decorating supplies. the image more visible for tracing onto fabric. Get ideas for free printables and downloads. top layer of onesie and trace with fabric pen. Use light layers of paint. Shop: Michael’s Crafts, Amazon, or your favorite fabric store for paints, and painting supplies. get free art images and more!